Here’s the painting of the month (or rather of the bi-month). Prints can be purchased at my FineArtAmerica page. Below I posted the initial sketch as well. 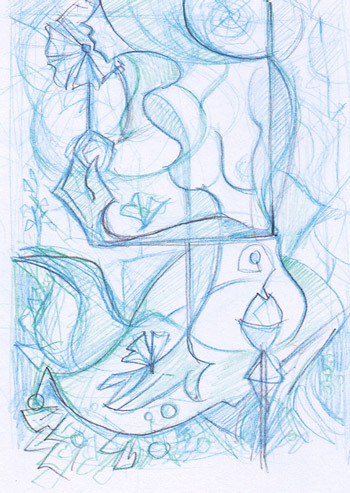 As with all my latest paintings the idea comes from sketching on paper. I approach drawing in a very gestural way, particularly for this non-naturalistic rendition. Paper and pencil provide the spontaneity I’m looking for. the first is for it to be attractive enough for someone to stop and look at it. We know how difficult things became for visual arts in our times. We are always one click away from another image and another and another…We are all great surfers but lousy divers. For a painting to engage a quick surfer there has to be something magnetic. We can objectively look for this quality. Either it happens or it doesn’t. the second quality I look for is depth (back to the surfer-diver analogy). 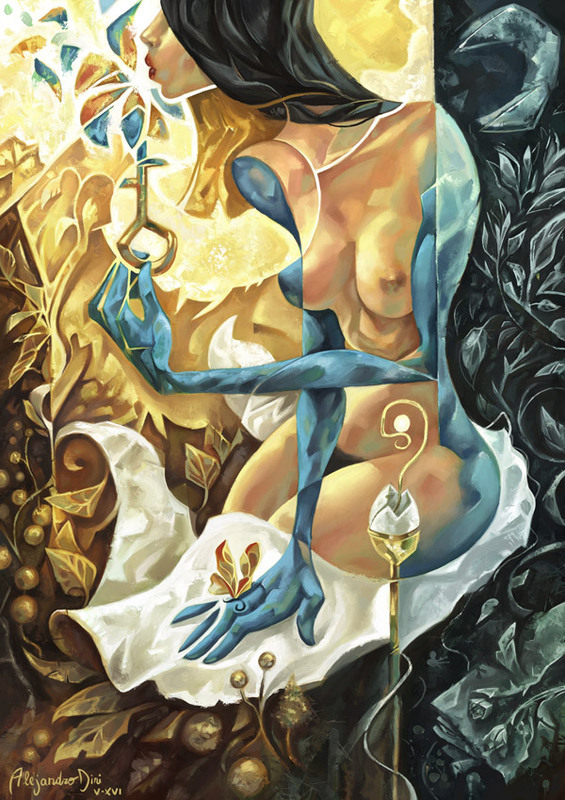 I like to paint things that are meant to be contemplated like tarot cards. The symbolism can start talking to the viewer once they let it. It’s not for me to say what the result will be. It’s an alchemical process between subject and perception. If you, viewer, feel charmed enough by the painting and decide to stay with it for a minute or more I’d be very thankful and you might discover a few things. Don’t do it to guess my mind, but let yours speak. I don’t conceive my paintings to deliver a message nor as mere translation of words in my head. They are not born out of a rational process. I must sketch a lot, often randomly, before something starts popping out. When I feel intrigued enough I start developing shapes and adding details and themes according to the feeling I’m getting. It’s a process of reviews, corrections and marination: yes, like food; I always need to let it “steam” for a while and return to it after minutes, hours or days. The sketch you see here is the 2nd I made. The first was almost identical except for a few details. I needed to go through it twice to understand the forms.You see why I’m so slow with personal work. In the end most symbols appear during the work. I don’t insert all of them willingly, save for the few that always call my attention and curiosity: the feminine, mystery, transcendence, the real, the imaginary. Very often I start to read more and more into my own paintings months after I’ve finished them. Sometimes I see symbolic connections between several of them, as if they were meant to be a story of sorts. Don’t take me wrong, I have a clear idea of what the Lady in the Key is and why I wanted to paint it in the first place. I wasn’t completely oblivious through the entire process, but I haven’t interpreted all its elements yet. I’m puzzled about a few choices I made, but I feel them to be appropriate. Feel is the guide.I’m very reluctant when it comes to describing my process, so I might wish to delete this post in the future, knowing how to me art is not about the artist but about the work. I don’t write this to justify or explain anything, but to invite everyone to be contemplative, to slow down and find once again the mysterious in our lives. It’s here, very few things can be turned into calculus and algorithms. All the rest is the open mystery of creativity. All I can say is that you really outdid yourself this time. This is now my new favorite. Before it was the Fallen Queen. I can feel the passage of time, cycle of the seasons, night and day, life and death, warmth & chill, luminous and ominous, etc… all wrapped up in one painting. The profile of the girl is also very pleasing to look at. And she appears to be holding the key to it all. I don’t try to understand it all, but there appears to be some great symbology here, like a map. The fragmented shard effect is also quite ingenious. I’m both elated and petrified at the same time.